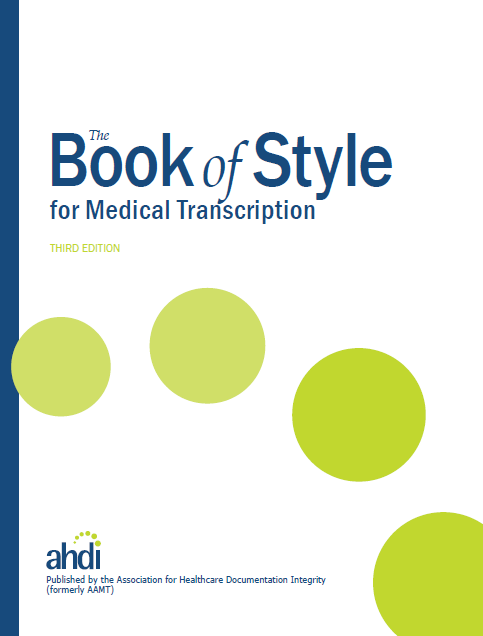 The 4th edition of the Book of Style & Standards for Clinical Documentation from the Association for Healthcare Documentation Integrity (AHDI) will be available in print and an online version. This widely acclaimed industry standards manual has long been the trusted resource for data capture and documentation standards in healthcare. The 4th edition delivers a streamlined and strategically reorganized flow of critical data, enhanced explanation of standards and practical application, robust examples taken from clinical medicine settings, and so much more. In preparation for the launch of both electronic and print versions of the BOSS4CD, we are offering limited sponsorships to industry friends and supporters. We hope you will take advantage of this opportunity to align yourself with AHDI and gain valuable visibility at the same time. Please click here for more details and the expanded targeted audiences. The 3rd edition of the Book of Style will continue to be available both in print and digital format. View more details on the 3rd Edition here. For more information, contact Member Services at ahdi@ahdionline.org or 800-982-2182.